The New England Patriots already have four running backs on their roster, but that’s not stopping them from looking into any and all options. 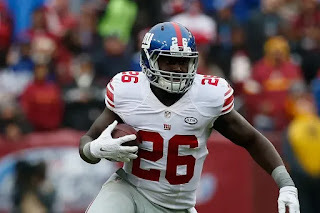 As reported by NFL Network’s Ian Rapoport, the Patriots held a visit with former New York Giants’ running back Orleans Darkwa on Monday. Last season with the Giants, Darkwa started in 11 games, while playing in 15. He rushed 171 times for 751 yards and five touchdowns. He also had 19 receptions for 116 yards on the year. Darkwa could potentially join the likes of Rex Burkhead, Mike Gillislee, Jeremy Hill and James White on the Patriots’ running back corps. He could help fill the void left by Dion Lewis, who is now signed with the Tennessee Titans.